We provide Ukrainian visa support, Odessa hotel / apartment accommodations, Odessa Transportation, tickets reservation, interpreter and guide services. Private or group sightseeing and excursion programs can all be arranged through UkraineTour travel agency. 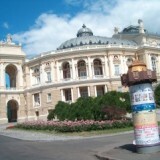 You will have the opportunity to visit fascinating Odessa historical sites and make side-trips to Kiev, Kharkiv, Kherson, Dnipropetrovsk, Nikolaev, Lviv, Zaporizhia & other cities. We promise to provide you with a unique, informative, memorable and enjoyable vacation experience. Meeting at Odessa Airport or Train Station and Car transfer. 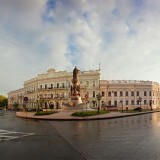 Odessa apartment or Odessa hotel accommodation for 6 nights. Optional services of Odessa driver or personal interpreter. Optional help with booking bus, train or plane tickets Kiev-Odessa. 7-10 day Kiev - Odessa tour that includes all kind of tour services from meeting at Boryspol Airport and Kiev Hotel / apartment stay to Train / Plane transportation to/from Odessa and Odessa apartment or hotel accommodation for 5-7 nights. Guide/interpreter. Special treat for boat tour lovers. Take a chance to visit Kiev, Dnepropetrovsk and Odessa Ukraine in just 10 days. If you enjoy panoramic views you can get from the riverboat - this tour is for you! Sure, it's not a cruise, but you get almost the same feelings and pay much less. Explore the cities with our English-speaking guides, take a boat ride and fall in love with the biggest river of Ukraine - Dnepr ( Dnipro in Ukrainian) and try a yacht in Odessa - the Black-sea jewel of Ukraine. Within 6 days you’ll visit dozens of the most known Synagogues, Jewish communities, Jewish cultural societies, Jewish educational establishments, theatres, restaurants & cafes offering traditional Jewish cuisine. You’ll be able to explore the Holy places associated with the founders and reformers of the Hasidic faith in Uman and Berdichev. For those wishing to visit the burial sites of friends or relatives, side-trips to Jewish cemeteries in various Ukrainian towns can be arranged. Complete Odessa tour order form or send us e-mail tour request and we will arrange the best travel plan at the lowest and most affordable price for your Odessa trip. If you want to know more about the details of the services, tours, packages or simply want to talk to a customer service - give us a call Toll FREE USA/Canada +1 (877) 302-0303 and we will answer any questions.